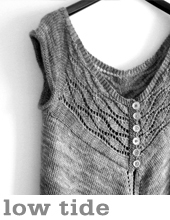 Learn to knit lace! Reminiscent of the arched windows of gothic cathedrals, this simple lace pattern is repetitive, rhythmic and symmetrical, making it perfect for beginner lace knitters. Intimidated by chart reading and blocking? We created an in-depth tutorial covering all the techniques you need for this project. 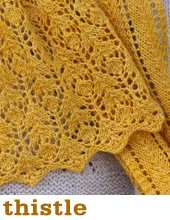 Get started knitting lace today! sizing Short (long) cowl measures approximately 10 inches wide by 22 (44) inches long before blocking. 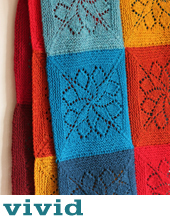 Scarf measures approximately 8 inches wide by 60 inches long. 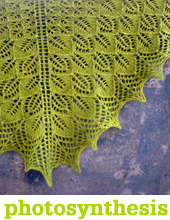 After blocking the piece will grow somewhat, depending on yarn choice and how aggressively you block the lace. Sample shown in Malabrigo Merino Worsted in "Frost Grey"
gauge and suggested needles Aran version - US # 8 / 5.0mm needles, to achieve a gauge of 18 sts/4"